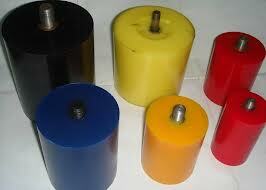 Polyurethane nip rollers are a combination of a drive roller and an idler roller working together. Polyurethane rollers are resistant to oil, ozone, abrasion, and impact, and offer superb load bearing characteristics. Precision rollers are available as: concave roller, convex roller, straight roller, hubbed roller, v-groove roller, bearing cover, coated bearing, bushing, and more.